Sacrifice what’s comfortable, be disciplined and execute properly. Train and stay relevant to ensure you get a ticket to the big dance. Be aware of your surroundings, your competition and the ever-changing marketplace. When you win, enjoy a limited celebration and get right back to training again with the same intensity that you had when you first started. They happen to you or through you! Have you ever wondered why some leaders go down in history as one of the greats? Better yet, wouldn’t it be amazing to be added to the list? As life-learners, we all yearn to be better than we were yesterday. We recognize that the world around us is rapidly transforming, so it’s a no-brainer that vigilance, flexibility and relevance is paramount. You must first be trained on the parts of the boat and their purpose. You must be given standard training on how to operate the boat. You must understand the responsibility of each person on the boat. You must prepare the boat, with a detailed checklist of items, before it is sailed. You must determine the wind direction. You must hoist your sails and point the boat into the wind. You must realize that along the way you will be faced with changing winds. You must make key decisions and adjust accordingly. You must accept that you are responsible for everyone on the boat. You must ensure that everyone is doing their job effectively. If not, the boat will not sail properly and you will find yourself off-course. Well, I could probably stop here and let you draw your own conclusion about the connection I have made to sailing and leadership. But, I won’t do that to you. I’ll leave you with this! Leadership takes initial and ongoing training to be truly successful. Although, there are textbook-standards to leading a team, transforming a company and keeping the boat afloat (pun intended), it is the leader’s charge to get everyone rowing in the same direction. Checklists and processes are key to ensure the organization is prepared, safe and set up for success. A leader must be forward-thinking and always checking the wind (sometimes affectionately known as understanding the customers’ needs and staying abreast of market dynamics). Once a direction is charted, it is the leader’s responsibility to take a head count, ensure everyone is on the boat and make the call to leave the dock. As the team sets sail, the leader must prepare the team for changing wind patterns (as this will occur). Changing winds may come in the form of new legislation, competitive pressures, customer preference changes and economic swings. Great leaders anticipate and adjust! Why? Because pivotal moments can either happen to you or through you! When the time is right, leaders adjust the mast rate to regulate the direction and speed. They stay connected throughout the journey with their key personnel. Why? Because leaders understand that each person on the boat has a responsibility. If they don’t do their job effectively, the boat will never sail properly. 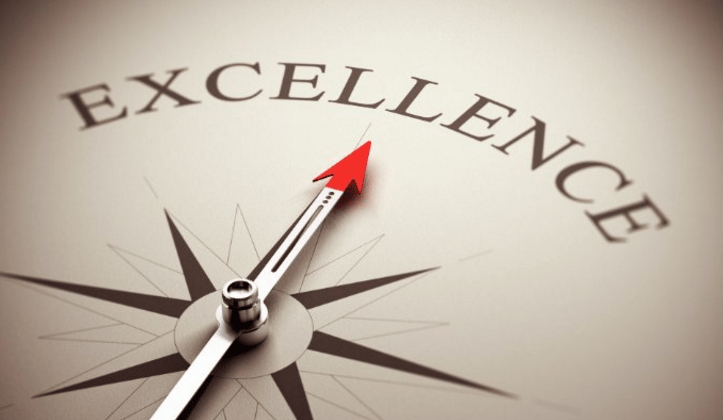 Is excellence a lost art? The more I experience life, the more I realize how far we have strayed from excellence as a society. The status quo is widely accepted and mediocracy has sadly become the norm for a lot of individuals. The question of the day is, why? Where is the work ethic of those that came before us? Has technology made us lazy? Are we too reliant on constant contact and information? Why don’t we focus enough time on building strong personal relationships? Why don’t we smile? Has social media forced us to live for “Likes” and “Retweets”? Why don’t we speak to each other, encourage one another and respect one another? Why don’t we volunteer, give with a cheerful heart and check our egos at the door? I really don’t know why excellence has seemed to slip away, but I do know this. As for me, my family and my team, we will be excellent! Excellence exists when leaders embody servant leadership and a commitment to positivity every single day. I will always challenge myself and those around me to be better than we were yesterday. If we are not doing our best, we become like the rest! Friends, stand with me in excellence! It’s a daily choice, not a lost art! Author NADRAPosted on August 10, 2016 August 10, 2016 Categories UncategorizedTags Kevin Jackson, KJ, Leadership, WolfLeave a comment on Is excellence a lost art?